Vicon drives open and innovative video products and solutions with unprecedented ease of use and customer experience. For nearly 50 years, Vicon has been designing and manufacturing a full portfolio of video camera security products. A pioneer in the development of megapixel cameras, video management software, NVRs, DVRs and video storage solutions, Vicon offers comprehensive IP-based security solutions that easily integrate with many third-party security solutions, including access control. 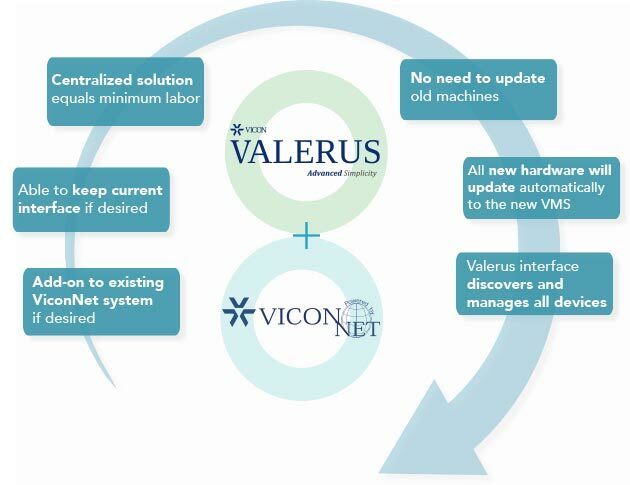 Vicon’s Valerus VMS is a unique, browser-based system with an easy-to-use interface designed to simplify your security operations. 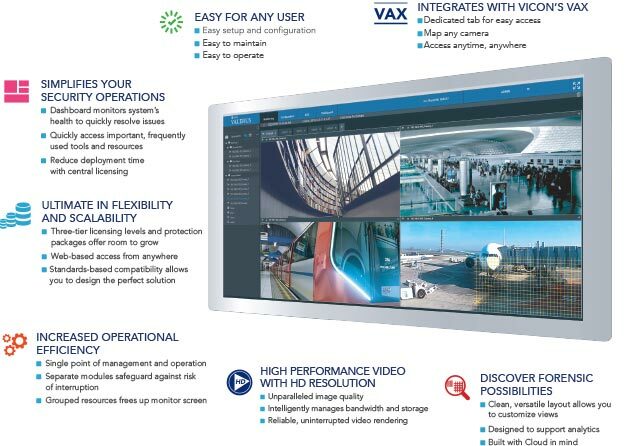 Vicon’s new VMS, ValerusTM, is an easy-to-install and operate video solution built on true open standards for optimized interoperability. It’s thin client architecture and central licensing offer ground breaking steps towards the future of security solutions. Based on years of experience in the security market and a look towards the future, Vicon’s new platform supports today’s conventional network systems and is ready for the expanding world of cloud computing. Valerus is a system you can invest in today and be confident it will be your solution in the future. Many companies claim they are “open” only to require “certification” of cameras and edge devices. Valerus is built on today’s true open standards as defined by ONVIF, an industry common protocol adopted by most cameras and VMS systems. By eliminating the need for individual certifications, Valerus offers the comfort of real choice with third-party integrations. Three license levels are designed to handle all types of security demands; this allows Valerus to meet your specific needs based on the requirements of your application and scale of your operation. The simple and cost-effective pricing model combined with optional upgrade protection program ensures long-term value. Valerus offers a wide range of display options, from “surveillance in your pocket” to video access from any PC. Whatever combination of displays you choose, you can count on consistent, intuitive and responsive interfaces that keep you in control. Available in software only or factory approved hardware, the application server controls the entire system with a single license. Contact us for all the support and advice you need for Video Security. We proudly serve Evansville, IN, and the surrounding area.